I once watched a pretty movie that described this exact exhilarating excitement. Even though the beauty of it lied in the events that followed, mine didn't. It stopped right there, like some unfinished poetry waiting to be read but never finished. A tale that was better left that way, without even trying to make up pretences about how it could have been or would have been if I had acted in certain ways. But, no. This real snippet was quite reassuring to my soul, perhaps not to the length of changing my point of view, but at least it softened the way I hold my interactions with another being. It all started just like any other day, but I took that one small hairbreadth leap, I went on a different route and ended up going to a dollar store. I saw this mug. A mug that I instantly loved because of its exquisite simplicity and the rare occurrence where the market supply matched my personal demand. 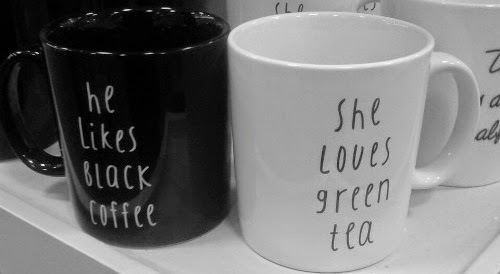 A mug that matched up to my own love. This mug, with its plain design, brought me another whole degree of unsuspected happiness. It was only a two minute conversation. I was smiling for politeness and he returned it. His eyes twinkled, like a laughter suppressed or an unvoiced thought. We did not pass the subject of mutual likings of a good cup of hot beverages and the best pastimes to accompany the enjoyment of drinking such liquid. It ended right when a feminine hand rested itself on top of his muscled arm. There was not any chemistry, only the cosmic coincidence that pushed us together both for an infinitesimal amount of time. But each of our parting smiles said the same thing: in another life. You are currently reading Mugs at Thunderloved.